Tables remain the most practical way of displaying large amounts of information to visitors. Unfortunately, creating tables manually using HTML and CSS is unnecessarily time consuming. Thankfully, there are a number of good WordPress plugin solutions that let you quickly insert stylish tables into your content area. This removes the need to write the HTML code yourself. In this article, I would like to show you a selection of the best table plugins available for WordPress. Ultimate Tables is a free WordPress plugin that allows you to insert tables into posts, pages, and other custom post types. Six different styles are available with the plugin. Alternatively, you can define your own class or apply no styling to the table. 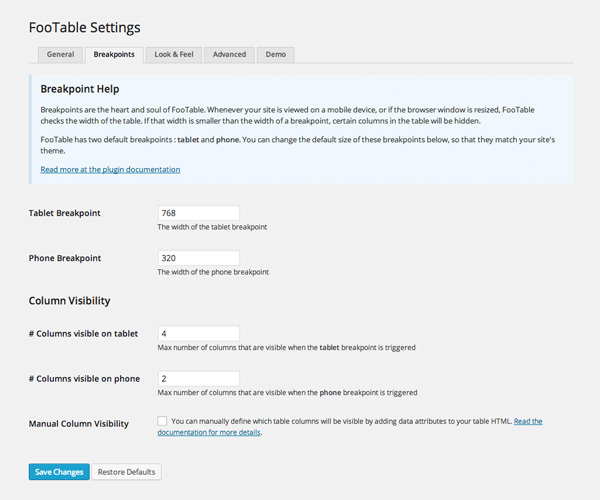 Tables are configured in the settings area. From here you can define rows and columns, and enter text or HTML into cells. Rows and columns can be reordered by defining their row or column number at the side of the table. 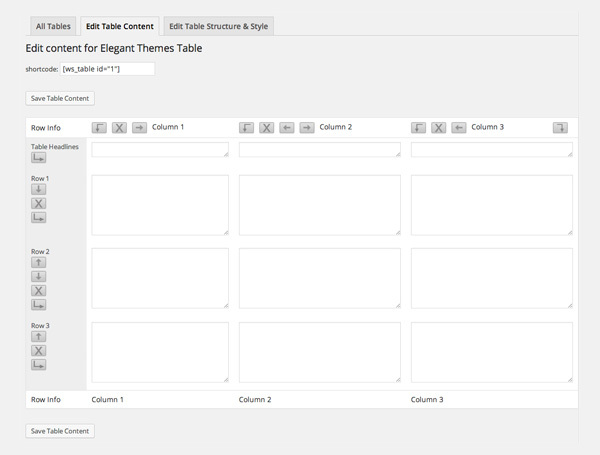 Tables can be configured from the plugin settings area. The output of Ultimate Tables looks great. Additional rows of data can be broken up into pages. 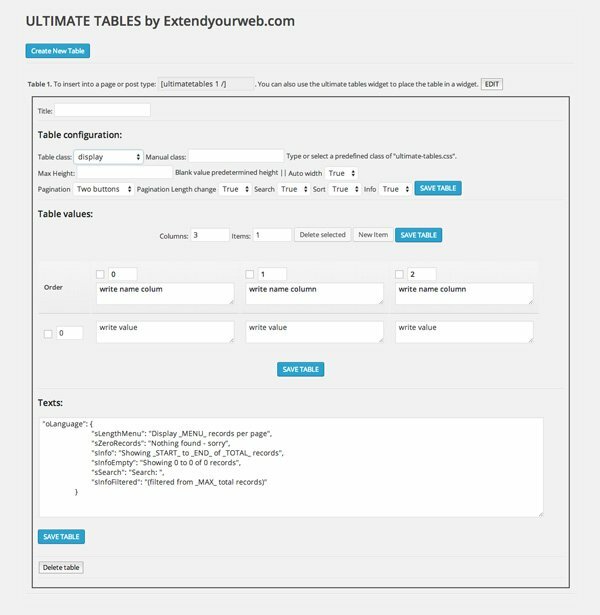 Ultimate Tables supports search, filtering, and sorting. Once you have completed your table, you can insert it into your website using a short code. The table can also be placed in a widget. Overall, I was impressed with what Ultimate Tables, but I do feel there are better alternatives available if you want more customization options. 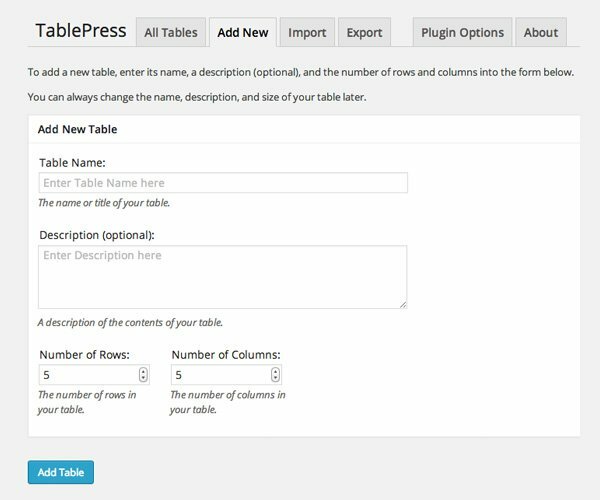 Formerly known as WP-Table Reloaded, the free plugin TablePress is one of the best table solutions available to WordPress users. The plugin is very easy to use. In the settings area, you define the table name, description, number of rows, and number of columns. It supports any type of data in cells (even formulas). It only takes a few minutes to add a new table in TablePress. Rows and columns can be moved, inserted, and duplicated. Cells can also be selected and combined into larger cells. 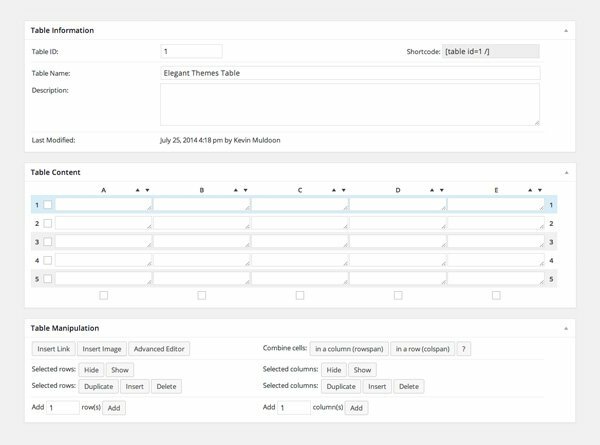 One of the great features of the plugin is the ability to select a cell and then add content using an advanced editor. This allows you to style content and insert images. Table headers and footers can be added too. There is also an option for alternating row colors and enabling row hover highlighting. TablePress offers a lot of customization options. TablePress features search and sorting functionality and table rows can be divided into pages. 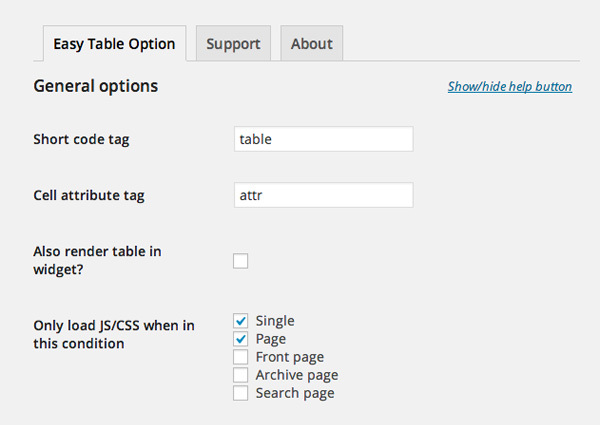 Custom CSS can be added via the plugin options page and then called in the settings area for individual tables. However, you will not be disappointed with the default design. TablePress has a lot of great features, particularly when you consider it is free to download. TablePress is one of the best table solutions available to WordPress users. With the ability to import and export data using CSV, HTML, and JSON, it is a practical option for professionals. Recommended. Easy Table works in a different way to other table plugins. It lets you add content using the CSV format in posts and pages. Therefore, rather than entering your content into cells, you separate columns by commas and add new rows by placing content on a new line. The CSV format doesn’t sound like the most user friendly way to add content onto your website, but once you understand how to do it, you will be able to insert tables much quicker than alternative table plugins. Easy Table has a lot of configuration options. You will be pleased to know that Easy Table walks you through how you can get the most from the plugin. The right hand column of the settings area explains all of the parameters that are on offer. Underneath there are examples of how these parameters can be used to create a table and a test area that lets you practice creating tables. 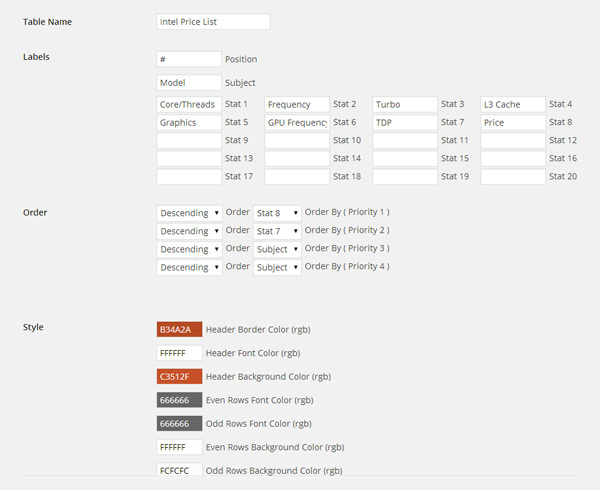 The options area lets you define the default styling options for tables. There are three styles available, however if you prefer, you can use your own CSS class. Styling settings can be overridden on a table by table basis. The output of Easy Table looks great. Once you understand how to add tables in Easy Table, you will appreciate how efficient the plugin really is. I recommend checking it out if you find adding tables through the settings area too time consuming. Websimon Tables is a free WordPress table plugin that lets you create HTML tables easily through the admin area. A new table can be created by defining the table name, number of rows, and number of columns. Alternatively, you can upload a table in CSV format. 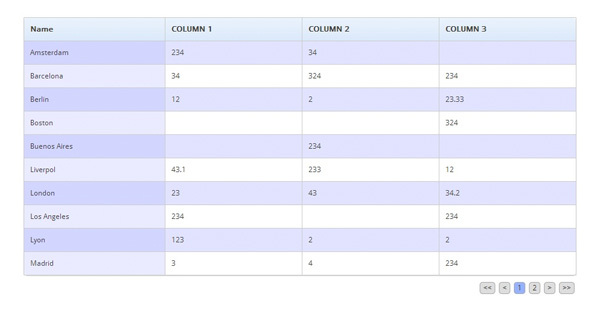 Rows and columns can be moved around your table using a user friendly arrow system. The plugin features a lot of great styling options. There are ten default skins to choose from in the settings area. Alternatively, you can create your own custom skin. The plugin lets you change column widths, padding, and margins. Additional styling such as CSS3 shadow effects, borders, and footers, can also be enabled. Websimon Tables lets you easily create colorful tables. Websimon Tables is a simple yet functional table plugin that has everything you need to add tables quickly to your website. FooTable is a free WordPress table plugin. It does not help you add new HTML tables. What the plugin can do is enhance your existing HTML tables. It will make your existing HTML tables mobile friendly by reducing the number of columns displayed and allowing mobile visitors to expand the smaller table to see hidden columns. It will also add sorting, filtering, and pagination. Three styles are included with the plugin and there is an option to add your own custom CSS. FooTable lets you adjust the number of columns displayed on tablets and smartphones. FooTable really transforms HTML tables and gives them a more professional look and feel. The demo area allows you to see how your tables will look in desktops, tablets, and mobile phones. FooTable allows you to style all tables or choose selected tables using a CSS selector. The plugin allows you to define the number of pixels before tables are shown in tablet mode or phone mode (known as the breaking point). This is useful if you find that tables are switching to a reduced layout too early. One of the most interesting things of the plugin is that it has native support for TablePress. This allows you to add tables using TablePress and then make them responsive by adding FooTable. League Table is a premium table plugin that is available from CodeCanyon for $12. 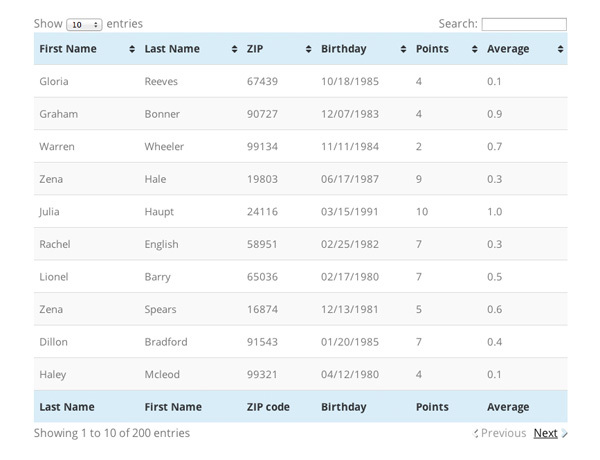 It was designed to create league tables, standings, ladders, and leaderboards. Although it is marketed as a league table generator, the plugin could be used to create any type of table. The color scheme of League Table can be customized via the settings area. I love the design of the tables that League Table creates. The design is clean and data can be sorted by any column. The tables are optimized for desktops, tablets, and mobile phones. League Table creates clean and professional table layouts. Like most table plugins, League Table uses short codes to insert tables into posts, pages, custom post types, and widgets. Worth checking out. Retailing at $25, wpDataTables is the most expensive table plugin in this article; however, it is arguably the most versatile. 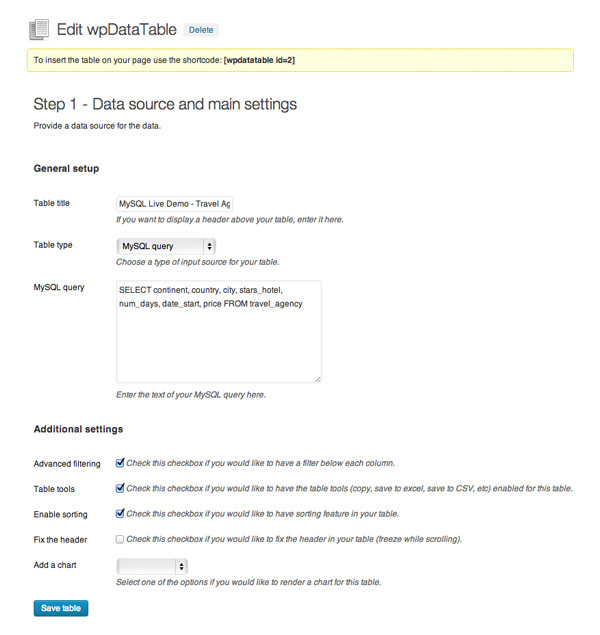 The plugin lets you create and manage tables through the WordPress admin area. Data can be manually entered or inserted using CSV, Excel, MySQL query, XML, or JSON. Utilizing a MySQL query will allow you to display tables that are over several thousand rows long. There are not many table plugins that can make this claim. Features can be switched on or off via the wpDataTables settings area. Fonts and colors can be modified via the settings area. You can also enable filtering, sorting, and table tools. There’s an option to display a chart from table data too. If you wish, you can also allow front end users to modify tables. wpDataTables supports a total of 45 languages. The above screenshot does not do wpDataTables justice, so I recommend checking out the official website of wpDataTables to see the plugin in action. This is a great list of resources. I tried and tested a bunch of these for a client project recently and ended up going with table press since it was simple and suited my purpose. Anyone interested can view the result (and website made with divi) here: http://www.whatwater.com/device-size-guide/ . It was very easy to import the CSV file my client provided so I was able to finish the table in about 10 minutes. Thanks for sharing all these other options as well. The leader board plugin looks really cool. I will have to check it out. html tables – oh yes I remember them well. Was a time when we used them as layout elements and then Divs and CSS (and IE hacks) appeared and we stopped using them. Tables are still good practice when they are used for tables. Thanks for another great resource Kevin. This would be a great way to add a page with a full table catalog of all our services and producs for someone to quickly skim through. Mostly I used TablePress plugin for any websites. League Table is looking great may be used in next project. I highly appreciate your posts, they are really helpfull for me. Could you please write something about plugins to make reservations for rentals? E.g. for boatrental, yoga lessons, etc. I love the people of ET! Great list of plugins Kevin. Tables still serve a purpose. Although in the era of responsive sites it is a must have to be able to display tables responsively. League Table looks great! Definitely look into this and it has come at the right time as I am working on a site to list statistics and a table like this will work perfectly. wow, Kevin, thank you for a very insightful article. I have bookmarked this. Great post. First time I came to know about the table plugins. Really love most of the plugins. Surely I’ll use TablePress among them. Thanks for this. Are any of these tables Responsive? That’s a pretty thorough list! These all seem to be designed to deal with complex tables quite well, and I wish I’d seen some of these last year! I’ve also found cases where clients just need a fairly simple solution, and for these, I’ve used MCE Table Buttons by Jake Goldman at 10up (shoutout) to give them an easy UI for adding small tables into their post content. MCE Table Buttons works on the 4.x series of TinyMCE (WP3.9+) and simply adds the TinyMCE table-generating toolset to generate the html table markup right in the post. This is a very different approach to the ones listed, and while it isn’t as easily customized or styled as most of those, it has the advantage of not using a shortcode, so once the table is there in the post or page, it’s there no matter what happens with the plugin later. I had tried several of this plugins, especcialy TablePress, but actualy my choice is ASAP Utilities for Excel, (http://www.asap-utilities.com/). 4 – Save and publish. Also has a lot of options to customize the output. Do you know which table would work best with handling several thousand cells? I know Table Press seems to freeze up with larger tables. You mentioned WP Table works well with large SQL queries, but what about when creating a table manually? Thanks! I’ve pinned this article! Tablepress And Websimons Are My Favorite Plugins !! what a nice plugin ….. thanks for sharing… its good rather than editing the themes files……. I am trying to add tables for competition fixtures for snooker in the first row after the header I want to have player name, the. In column 3,5,7 have the frame score 1-2 then in row 2 columns 2,4,6 have points scored between both frames with a diagonal border between top left corner on row 1 column on column 3,5,7 and bottom right of row 2 column 2,4,6 with the cells of column 2 & 3, 4 & 5, 6 & 7 of each row merged and row 1 & 2 mergedto show data correct. Thanks for the heads up i have implemented 1st table in my post: http://www.nomeme.in/air-hostess-courses-mumbai/ do checkout and let me know if am missing anything from look and feel part. Also i don’t like width of column headers which should be editable as per the need. BTW: are you using any kind of custom css with the tables? I think we will use it one more posts, too. Thank you. Looking for a table that requires no html knowledge and capability to insert images. Tried TablePress already. I am using TablePress and I still have a problem with that. I am finding a new table plugin for my blog http://www.woblogger.com/ and I came here. You introduced a great list of plugins and I will try with the best one. Thanks for this i purchased the wpDataTables as it seems to be the best one of the lot with all the bells and whistles…. i especially like the option to save as PDF i think many clients can make sure of this feature. Hi, is there a way to retrieve only the selected column from tables (which I created using Tablepress)? For example, I want to retrieve the data for column “name” and “birthday” only, and then display this data in another table (I can create this table manually using html). Please help. Really helpful, thanks for the tips! Thanks for this great collection of table plugins. I have used most of these plugins and all are working nice, I am really happy with all of these plugins. 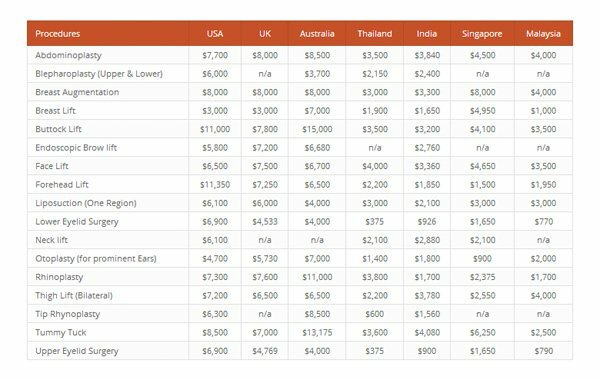 any help on how we can insert tables in WordPress without using plugins, as the number of tables I insert would be very low for using the plugin.